Investigators have released an update on the Washington train derailment after conducting interviews with the train driver and conductor, who were both in the lead locomotive during the incident. 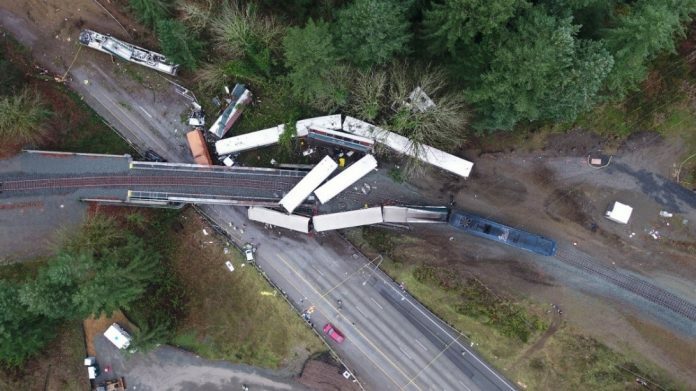 The United States’ National Transportation Safety Board (NTSB) released preliminary findings earlier this month, revealing that the train was travelling at 78mph in a 30mph zone when it spilled onto the road below, killing three passengers and injuring 70. Notably, it stated that had positive train control (PTC) – an advanced train control system – been implemented, the train’s brakes would have been applied in line with the speed restrictions. The train driver and conductor could not be initially interviewed because of the severity of the injuries they sustained. Following interviews, NTSB found that the train driver didn’t recall seeing the 30mph advance speed sign, which was posted two miles ahead of the speed-restricted curve. The Amtrak driver – a 55-year-old male who has been a train driver since 2013 – said he did “see the wayside signal at milepost 19.8 (at the accident curve) but mistook it for another signal”. He said that he was aware the curve with the 30mph speed restriction was at milepost 19.8, planned to initiate braking about one mile prior to the curve and applied brakes as soon as he saw the 30mph sign at the start of the curve. However, seconds later, the train derailed as it entered the curve. The driver told investigators that he felt rested at the start of the shift, felt confident in his ability to operate the train and that having the conductor – a 48-year-old male who had been an Amtrak conductor since 2011 but had never previously worked with the driver – was not a distraction. The NTSB said that the driver had qualified on the route and had completed between 7-10 observational trips and three trips operating the train prior to the accident. The conductor said that there was minimal conversation between himself and the driver. Instead, he said, he spent the time looking over paperwork “to help learn the territory”. The NTSB added that the interviews will form part of the information considered during its investigation, which is expected to last between 12-24 months.